Guillemette supports Orange executives in individual coaching (taking up new positions and development) as well as in collective workshops (developing my talents, recognizing my drivers). Previously, Guillemette held positions as operational and strategic marketing product manager and animation manager in the field of product, service and innovation design. 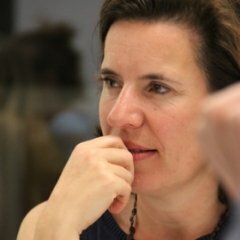 With a long experience as a facilitator of collective intelligence internally and independently, she designs and leads thematic workshops at conferences (France, Italy, Canada) in the field of creativity and innovation (drawing inspiration from cathedral builders to engage teams, playing with motivational levers to design…). Holder of the University Certificate in Creativity Training (University of Paris V), Guillemette has followed various training courses at Crea Conference, she is also certified at MBTI and Lego Serious Play (LSP). She uses Creative Problem Solving both in the guidance of individuals and teams because she particularly likes to support transformations. She defines her coaching style as follows: “recognize and develop everyone’s creativity to meet collective challenges”.